While thrown behind bar on the order of Akol Koor Kuc, Director General of the National Intelligence and Security Service for internal affairs, exactly on the first day of this month (November 2011), human right organizations acting in solidarity with media fraternity sprung up to their feet to pressure our release from detention. The group I owe thanks and for whom I wrote this special note includes the widely read online Sudan Tribune, reporters without borders, Amnesty International, Committee to Protect Journalists, Association for Media Development in South Sudan, Community Empowerment for Progress Organization and South Sudan Human Right Society Advocacy. Personal friends and relatives included my own brother Albino Garang Arol Garang, Reverend William Mou Deng, Lual Agel, Majok Kanajak, Ateny Wek Ateny, Tong Deng Anei, Akol Ayom Wekdit, Mading Ngor (the manager of another online news provider dubbed New Sudan vision), Nhial Bol Akeen, editor chief of the citizen newspaper, Dr. Dhieu Mathok Diing Wol and Dr.Luka Biong Deng both of whom are senior members of the South Sudan’s ruling party, the Sudan People’s Liberation Movement (SPLM), among others, courageously stood with my family members. The reason which necessitated my arrest is that on Saturday 22, October 2011, the residents of Juba, as members of the public may be aware, witnessed the wedding ceremony of the President Salva Kiir Mayardit’s daughter, Adut Salva Kiir, to Nardes Jebeyehu Alemneh, as husband of her choice. Almenhu is an Ethiopian migrant in South Sudan. The ceremony attended by senior government officials was held at Rejaf Catholic Church where the president was officially seen handing over his daughter to bridegroom in the presence of the family members and relatives including friends. Viewed as bridal right since it is claimed that love has no borders, the acceptance of the president to allow his daughter to marry a foreigner without objection, met with a lot of hard feelings and public disquiet including individual members within the president’s own family. Causes of commotions were grounded on cultural practices and traditional values managing marital rights. Some customs and traditions views president and other high ranking officials as symbols of national integrity and pride, thus putting them under close public scrutiny, including examining the backgrounds of those seeking to marry from their family members. Many argued that president owes thanks and appreciations for bypassing traditions and customs which holds freedoms of daughters and sons to marry based on their choice. Others supported traditional practices of which some cultures in South Sudan including the Dinka tribe, to which the president belongs, requires that someone intending to marry from a high class family must have a clear family background. This includes pleasant personalities as well as being a well known for achievements in the community from where the bridegroom wants to marry. Little was known about the president’s son in law since he comes from another country. This prompted many citizens to react against the marriage in social forums and other networks including internet based forums where community members share events, latest developments and current affairs with those residing outside the country. Others reacted in the print media some of which include The Citizen and Almasir daily newspapers which are some of the print media widely read in Juba. The public reaction carried on for more than four days until on 26 October, when The Destiny newspaper, which was just being established, published an opinion written by a columnist called Dengdit Ayok, protesting the marriage. While the opinion was generally seen as another voice reflecting public reactions against the marital arrangement, some of the public members including elements from the National Intelligence and Security Service saw it at different angle including interpretations and arguments that the opinion had gone beyond limits of the freedom of expression into privacy. Some views argued that some words of the opinion, especially the part blaming the church for blessing a bride claimed to be pregnant, should have been edited to avoid questioning religious teaching. Others claimed that churches including the Roman Catholic to which the bride belongs do not bless pregnant brides. Other areas included the part questioning role of the presidential security guards, who seem to have not lived up to their duties to the extent that a foreign national easily gained access to the house of the president to make an affair with his daughter, casting doubts about ability of the guards to provide adequate security to the president, especially at the time when some of the senior government officials have always been heard complaining against external support to rebels fighting to remove his government from the power. Other fears were connected to safety of the president because of the international reports claiming that South Sudan is one of the countries in east Africa susceptible to terrorist attacks. As talks against the marriage continues to be introductory point of any social gathering, the board of directors of the Destiny newspaper, on 28 October, convened a meeting in which a decision was reached to suspend the columnist who wrote an opinion believed to have exceeded right to freedom of expression to enter privacy. His membership in the paper was suspended for one month and the management of the paper subsequently wrote and published a statement apologizing for publishing critical opinion on a family affair on 31 November. A copy of the apology was given to the family of the president and another to the ministry of information and broadcasting. The intention was to contain public reactions as voices against the marriage continues to dominate street talks in Juba. Reasons for suspending columnist who serves as deputy editor in chief included violation of the editorial policy and operating procedures which requires all the reporters and opinion writers to submit articles and opinions to the managing editor and the chairman of the board of directors for scrutiny before publication. These procedures were bypassed as the opinion writer wrote his own opinion and submitted directly to the designer whose work is limited to only laying out and design of the paper. Another observation was the use of poignant language which hurt the feeling of family of the president as well as selection of some words blaming other institutions. On 1st November, the National Intelligence and Security Service arrested me on assumption that I, as the member of the board of directors trusted with the editorial responsibility, have approved publication of the opinion which they believed have gone into privacy of the president and his family. This follows a meeting held on 31 October between Akol Koor Kuc, the Director General of the National Intelligence and Security Service and Dr. Dhieu Mathok. Kuc and Dr. Mathok, who is the chairman of board of directors, could not reach a consensus on the demand that the opinion writer be handed over to them (National Security) for investigation, thus decided to invite me in the next meeting. Kuc (the Director General for National Security) told Dr. Mathok that the purpose of the meeting would be to know one another with the editors and to see how best they in the security section could work together with the media practitioners in gathering information for common good of the country and the entire citizenry. Kuc, however, on 1st November, trashed the purpose of the meeting as he told Dr. Mathok and turned it into an interrogative session asking why the opinion was published and subsequently ordered my arrest into the cell within the headquarters of the National Security located at Jebel Kujur. He also handed an official statement suspending the paper until further notice and equally instructed his subordinates to look for Dengdit Ayok to bring him into the cell too. On 5th November, exactly five days after my arrest, the security elements after amounting intensive search, brought in Ayok and took him to a separate cell where he was kept without talking to other detainees until after four days. Brought after I have complained against torture and other abuses to the chief investigator, Ayok received only slaps and verbal abuse and was never beaten until we were released. In the detention, I was subjected to callous treatment, tortured; saw degrading handling and denial of all fundamental right including family visit for the whole week. No access to medical examination even when I was visibly seen very sick as a result of unwarranted beatings. No lawyer was equally allowed to me and no charges were brought against me. I was kept in an isolated place within the cell where I was not allowed to talk to other detainees for the five days. With other prisoners, we were forced to lay down to be walked on with boots as an interrogative means of getting other information about us. This became the source of why I always get into problems with the security guards who were fond of torturing people because I do not accept laying down to be walked on and to be beaten. Besides torturing, the environment in which I was held was another form of torture. One could knock against objects and hard standings when even one tries to visit a relieving facility located within the cell, because it was ever dark making it difficult to know the presence of other people around you. The only way to know presence of other people was through touching or calling the name of the person you need to talk with. Another form of torture was clearly seen in feeding. 1.5 liters of bottled water was shared amongst four people and one piece of bread a day. Food from family members was either eaten by the guards or rejected on the pretense that prisoners are fed in the cell. One of my family members I have never seen until I was released claimed to have been taking the food and water to me while being held. That he deposits the food and water at the reception where he was not allowed to visit where I was held. Besides this form of treatment, the hygienic condition was always in horrible shape as the environment was ever emitting foul odor. The cells were always full and congested beyond accommodating capacity. There were no opening spaces for ventilation. This makes it possible to contract contagious skin and airborne diseases. People who were notably sick including constant cough with difficulties in breathing in the cell were put together with other detainees. With the mounting pressure demanding our release on the government increases, the chief investigator, on 17 November, told the guards to inform us to be prepared because we were to be taken to the court that day, which we welcomed but no move was taken until we spent another night. On the following day which was 18, the Inspector General of police, General Acuil Tito Madut, presumably after communications with the Director General of the National Security sent a colonel from ministry of interior who works in the department of criminal investigation unit (CID) so we are brought to him. The colonel with five others went and brought us to him (General Madut) the same day evening. In his office after arrival from the national security headquarters situated at Jebel Kujur, west of Juba town, General Madut said he was asked by the president to pass on to us his resolve to release us without going to court. That marks our release without charges. The General only asked us to refrain from writing against any public figure in the future, especially after I insisted on asking what I have done to warrant arrest and torture, to forgive and take it a lesson not to allow any subordinate to publish an article or opinion without my consent. In the evening of 20 November, the family of the president and I in the company of some members of my family met during a meal prepared to bring us together. We exchanged smiles and greetings before getting into real discussion prior to reaching a wrapping up to restore trust and understanding to foster peace and harmony. The author can be reached at ngoraguot@yahoo.com or alternatively ngorgarang8@gmail.com He is the managing editor of the suspended Destiny daily newspaper and a correspondent of the Sudan Tribune. New York, November 21, 2011--Dawit Kebede, managing editor of Awramba Times, one of Ethiopia's two remaining independent Amharic-language newspapers offering critical analysis of local politics, announced today that he was forced to leave the country after he received a tip last week about alleged government plans to re-imprison him. Kebede also said that the paper was unlikely to continue publishing. Kebede, whom CPJ honored a year ago for perseverance in pursuing independent journalism in Ethiopia despite ongoing government intimidation, told CPJ from Washington, D.C., that official sources warned him on Thursday of preparations by the Ministry of Justice and Government Communication Affairs to revoke the conditional pardon that authorities offered in 2007 to him and other imprisoned journalists rounded up in a brutal November 2005 crackdown. "Dawit Kebede has endured all of the Ethiopian government's tactics to silence independent voices, from official intimidation and state-sponsored smear campaigns to the jailing of his staff. The silencing of Awramba Times leaves the country with only one remaining independent critical newspaper," said CPJ Africa Advocacy Coordinator Mohamed Keita. "The Ethiopian government's persecution of those seeking to report the news and raise critical questions about issues of public interest has driven the largest number of journalists in the world into exile." Kebede said the tip-off followed an October 19 editorial in the ruling Ethiopian Peoples' Revolutionary Democratic Front-controlled state daily Addis Zemen, which accused him of links with "terrorist groups," called on the government to revoke his pardon, and urged security forces to "to take action" against him. Kebede sued Addis Zemen earlier this year for defamation over a series of similar articles, but a judge dismissed the lawsuit in July, according to CPJ research. Kebede said he has also been the target of attacks by pro-government media personality Mimi Sebhatu on her station, Zami FM Radio. In interviews with Bloomberg today, both federal prosecutor Birhanu Wendimagegn and Ministry of Justice spokesman Desalegn Teresa denied allegations that they were planning to arrest Kebede. In 2007, Kebede pleaded guilty to trumped-up charges of "inciting and conspiring to commit outrages to the constitutional order" over an editorial criticizing extrajudicial killings of unarmed protesters by security forces in 2005. He was sentenced to four years in prison but was released on conditional pardon. With his former newspaper Hadarbanned, he launched Awramba Times in March 2008, after the government initially deniedhim a license. In May, the government-controlled media regulatory agency Ethiopian Broadcasting Authority accused Awramba Times of "inciting the public to destruction" over what it called "negative reporting" of ongoing inflation and the unrest in North Africa and the Middle East, according to news reports. In June, authorities imprisoned Awramba TimesDeputy Editor Woubshet Taye on vague terrorism charges. Ethiopia's repression over the last decade drove the highest number of journalists into exile in the world, according to a CPJ study. 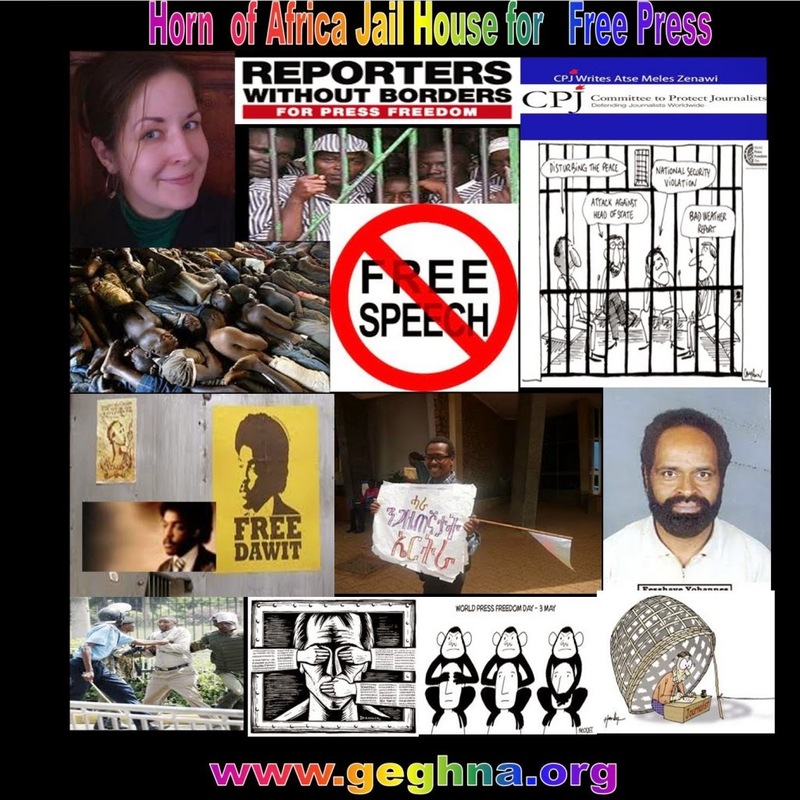 Ethiopia trails only Eritrea as Africa's leadingjailer of journalists. An Ethiopian court has dropped charges of participating in terrorism against two Swedish journalists. An Ethiopian court has dropped charges of participating in terrorism against two Swedish journalists. But Johan Persson and Martin Schibbye still faced charges of supporting a terrorist group and entering Ethiopia illegally, the judge said. They were arrested in July after being caught with fighters from an Ogaden National Liberation Front faction. They had pleaded not guilty to the terror charges, but admitted entering the country illegally from Somalia. Mr Persson and Mr Schibbye could face up to 15 years in jail if found guilty of supporting the ONLF rebels, the AFP news agency reports. Judge Shemsu Sirgaga made his ruling after the prosecution closed its case at the trial in the capital, Addis Ababa. "Though the prosecutors have provided witnesses and evidence to support their accusation, the court does not believe it is substantial enough to prove that the journalists were involved in carrying out a terror attack," Reuters news agency quoted the judge as saying. Earlier this week, prosecutors screened video footage obtained from the journalists' laptops, showing the pair travelling in Ethiopia's Somali Region - more commonly known as the Ogaden - holding guns. The two men will remain in custody until their trial resumes on 6 December for the defence's presentation. Since the 1970s, rebels in the Ogaden have been fighting for the Somali-speaking Ethiopians, who they say have been marginalised by the government in Addis Ababa. One ONLF faction signed a peace deal with the government last year, but another splinter group has continued to fight the army. Human rights groups have repeatedly accused the government of widespread atrocities in the Ogaden, where journalists need permission to travel. 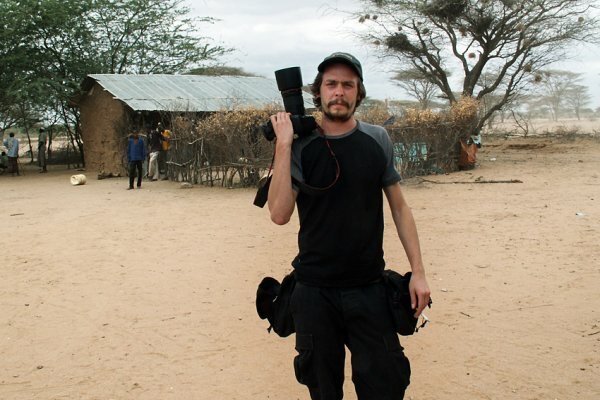 A judge in a trial against two Swedish journalists arrested in Ethiopia said Thursday he accepts the prosecution's argument that the pair were supporting a terrorist organization. Judge Shemsu Sirgaga made the comments as the government's prosecution team closed its case at a trial in Addis Ababa, Ethiopia's capital. Ethiopian troops captured journalists Johan Persson and Martin Schibbye during a clash with rebels in Ethiopia's restive east in July. Journalists are prohibited from traveling freely in Ogaden. Persson and Schibbye, who face up to 15 years in prison if convicted, acknowledge they entered Ethiopia illegally. However, they have said they were gathering news at the time of their arrest. Their lawyer is to present their defense on Dec. 6. The judge said the prosecution established that the two tried to assist the Ogaden National Liberation Front, which the Ethiopian government classifies as a terrorist group. The judge said Persson and Schibbye met with key ONLF officials in London and Kenya and "marched into Ethiopia" with ONLF gunmen. He also said the pair violated migration laws and Ethiopia's national sovereignty by crossing the border illegally. The lawyer for the two Swedes, Seleshi Kebsele, told the court that he would present eight witnesses in his clients' defense. The judge also convicted two Somali defendants arrested with the Swedes on charges of terrorism, which is punishable by death. The defendants said they didn't have any evidence or witnesses to testify for them. The court is to announce their sentence on Friday. Video: Assange statement after lost battle in UK court - YouTube: " "
Johan Persson and Martin Schibbye were jointly charged with two fighters from the Ogaden National Liberation Front (ONLF) of Somali decent. The court closed its case on Wednesday after screening a nearly three hour long video clip purportedly showing the journalists alongside the rebels holding Kalashnikov assault rifles. Prosecutors said the clip was obtained from a laptop belonging to the journalists. It also shows the journalists being briefed about the Ethiopian map and how to cross the border with Somalia to meet ONLF leaders. The two were allegedly escorted by around 22 gunmen across the Ethiopian border with Somalia. Two of the ONLF fighters on trial with the journalists are also shown on the video telling the Ethiopian army that they were in a group of 24 fighters with the Swedes when they were caught. The other fighters were reportedly killed in the battle. Persson and Schibbye who are denying the terrorism charges were allegedly scheduled to interview people displaced by the fighting in the Ogaden region, which is seeking autonomy from Ethiopia. "We want you to show our suffering and to report this to the world so that the world knows how we are suffering in our land," one of the rebels is shown saying on the video. But defense lawyers argued that the video could not be submitted as evidence in court. "We are waiting to see on Thursday what might happen. It is too late to tell you something on the issue," said one of the defense lawyers. Several witnesses have already testified in the case with some claiming the journalists wanted to train ONLF fighters. ONLF is a classified terrorist organisation according to the Ethiopian government. Persson and Martin Schibbye were arrested in July on the border with Somalia. Al Jazeera talks to Ai Weiwei - YouTube: " "